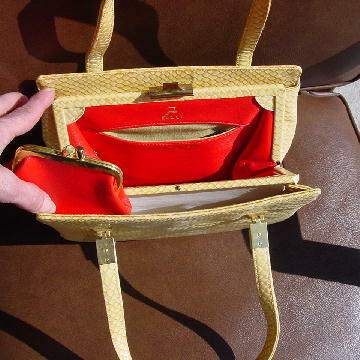 This vintage spring and daffodil yellow purse has a bright red interior and is made of genuine leather. The center has two interior pockets, one open one with a fabric lining and the other zips and has a fabric lining in alternating horizontal stripes of orange, gray, blue, red, yellow, and green. 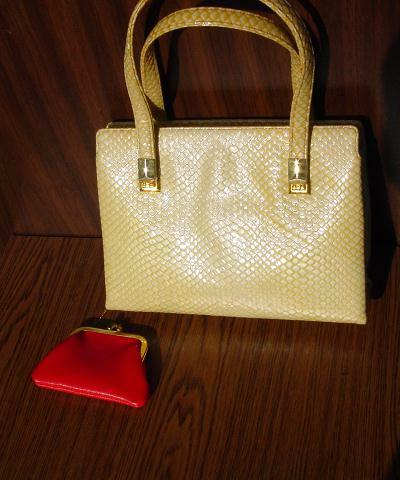 It has a red interior change purse attached by a thin gold chain. There are also two full side white leather sections. 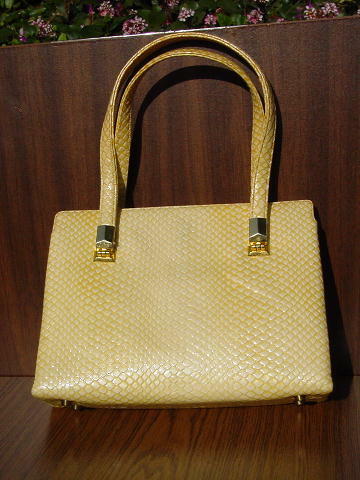 The exterior white leather is covered by thin "scales" in a spring and daffodil yellow. There are two 17" handles attached to the body by gold-tone ornamental hinges. The bottom has 4 gold-tone feet. There are a few "scales" missing from the sides of the handles and at the bottom of each corner. It has a gold-tone metal center closure.